I recently ran across "Weekend Project: YouTube Downloads, Mashups, Screencasts, and More," and it inspired me to share some of my own YouTube tips with you. Read on for how to embed a video in a blog (or other Web page), use YouTube as a commercial-free video jukebox, and filter out inappropriate comments. YouTube videos are meant to be shared. But the best way to share them is not by copying and pasting a link, but rather embedding the actual video in your blog, Web page, or the like. That way, your visitors can watch the clip directly without having to click away to YouTube proper. Embedding a video used to be pretty straightforward, but recently YouTube has made some changes that make the process a bit more confusing. 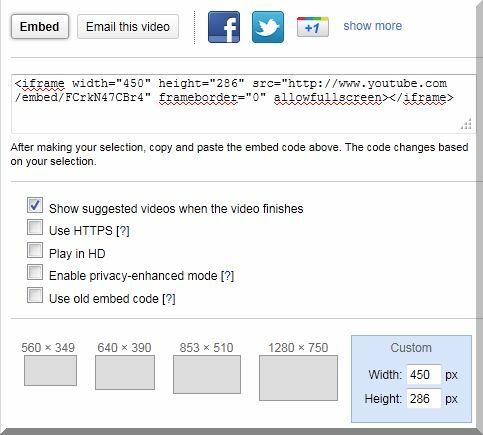 Here's how to handle video embeds. Open the YouTube page containing the video you want to embed. Just below the video window, find and click the Share button. Then, at the bottom of the "Link to this video" box, click Embed. You'll see a highlighted chunk of text. This is the "embed code," which you'll need to copy and paste into your Web page. You can do so immediately by right-clicking the text and choosing Copy. However, you may want to modify some options first. Notice the five check boxes below the embed code. The one I have to enable most often is Use old embed code, which provides a different chunk of code that's more widely compatible with blog tools. Make sure to enable any of these options you need before copying the embed code. Now let's look at a YouTube feature designed for music lovers: the YouTube Music Discovery Project, which is designed to serve up an endless supply of your favorite artists' tunes. Just type in the name of a favorite song or artist, then click Disco!. In a flash, YouTube creates a playlist based on that song or artist--the contents displayed in a scrolling thumbnail bar at the bottom of the screen. You can mouse over any song and click it to jump directly to it, or just let the playlist run in its regular order. You'll also notice controls (on the right side of the bar) to turn Autoplay on or off and enable or disable shuffle mode. This is a great way to discover not only new music, but also new versions of your favorite songs. For example, I put Disco to work on Coldplay, and the first song it played was an extraordinary cover of "Viva La Vida" by a group of schoolkids. You can use YouTube Disco as a kind of video jukebox, or just as a commercial-free alternative to services like Pandora and Slacker, streaming tunes in the background while you work. As I'm sure you can guess, the service is free. YouTube doesn't filter user comments, and some of them are downright atrocious. I've seen hate speech, profanity, and ridiculously excessive punctuation. Okay, that last one's merely annoying, but the fact remains that YouTube can expose your kids to decidedly inappropriate language. Thankfully, there's an add-on for that. YouTube Comment Snob for Firefox filters undesirable comments from YouTube video pages. It's not foolproof, but it definitely helps. The tool blocks comments based on one or more criteria: all capital letters, no capital letters, excessive punctuation and/or capitalization, and so on. It can also kick in when it detects a certain number of spelling mistakes. Most importantly, YouTube Comment Snob filters comments that contain profanity. If that amounts to snobbery, then a snob be I. This is a must-have add-on for parents trying to protect their kids from the Yahoos (the "Gulliver's Travels" variety, not the search engine) of the Internet. YouTube is supposed to be fun; now it can be a little safer as well. If you've got a hassle that needs solving, send it my way. I can't promise a response, but I'll definitely read every e-mail I get--and do my best to address at least some of them in the PCWorld Hassle-Free PC blog . My 411: hasslefree@pcworld.com . You can also sign up to have the Hassle-Free PC newsletter e-mailed to you each week.